I have an impish sense of humor. I like to tease, joke, poke fun, and be mischievous. I always have. That's ultimately why I was kicked out of Boy Scouts. I don't think I'll ever outgrow it. One of the ways this manifests itself is that I like to put my bigfoot business cards in places where other people will run across them. Sometimes I even hang out and watch people's reactions when they find and read the card, but more often than not I leave them there like paradigm-shifting landmines. I put them in elevators, restrooms, bars, restaurants, or any other place that will hold them near eye level. I really enjoy putting them in places where almost nobody looks. That way, when somebody does find one, I know that person is likely eccentric and will probably take the time to check out the site. Once, after dropping a few in a sporting goods store, I witnessed one of the employees go up to the manager holding my card. She was giggling heavily, but between breaths she asked the boss if he'd like to be a bigfoot researcher. They gaffawed and insinuated that whoever this Cliff guy is, he must be a total kook. I could hardly contain my glee at witnessing this exchange. I always remember that since sasquatches are real animals, the last laugh will be on them. Additionally, I have a small army of volunteers doing this same thing for me across the country. I know that many of you have picked up one of my cards in airports or hotels throughout the United States. That was probably the work of one of my nameless minions. More of a "me" than a "we". Still, have you seen one? Let me know! Recently, a reader of this blog sent me an email with a link to a blog called PDX Occulture: http://www.pdxocculture.com/node/6174 Apparently this woman found one of my cards somewhere in downtown Portland and liked it. Thank you, "BeautifulPyre" for taking the time to share my card with your readers! Besides the sheer coolness of having my efforts shared with another audience on this woman's blog, I think it's interesting to note that her brother saw a sasquatch in Skamania County. I'm often asking folks on the street if they, or someone they personally know, have ever seen a sasquatch, and here in Portland I get a "yes" about one time out of five. Sometimes more, sometimes less, but it probably averages out to about a 20% affirmative vote. This woman's blog entry on finding one of my cards just goes to affirm that. If you found one of my cards somewhere, I'd love to know where. Feel free to post a comment below to share where you stumbled upon one. 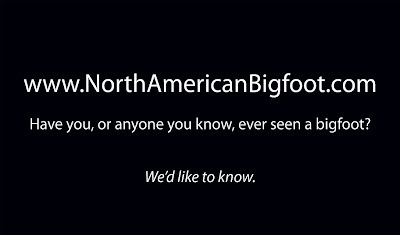 found one of your bigfoot business cards in an elevator in Kentucky. 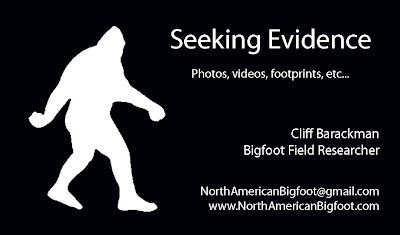 We have Bigfoots in Kentucky, you should get a camera team and get out here and document these things.